We got a chance to have a conversation with singer Anuj Sharma. Anuj was kind enough to discuss in length about his life, his latest album Khwaab and the roadmap ahead. How has been your journey as a singer so far? Great as I enjoyed it thoroughly! It started long back but I feel I still have lot to achieve. In childhood I used to sing for my brother only. He used to push me to sing in front of other people but I always refused. Real exposure to true singing came in first year of B.A, I sang in front of few people & among them who picked & shaped me was my Music Professor Baldev Thakur. He sensed my strength & wanted as he used to say "polish and shine like diamond". In my first public appearance for a competition I won the best singing award & life changed from there. I started singing Himachali folks & kept winning the university level competitions. I did masters in Music & won many competitions at different levels. Fame came through Indian Idol, which took my passion to level much higher than expected. For last three & half years after Indian Idol, I performed at various locations in India, UK, Singapore...at various events such as Diwali fest, Bansat fest. People enjoyed and appreciated my singing. From a guy who was not able to sing in front of few people to a person who can move feet of thousands of people. My Debut album "Khwaab" is just a gift for both kind of people those who supported me & for those who criticized me. I feel with this I have made some happy & forced the others to judge me again. 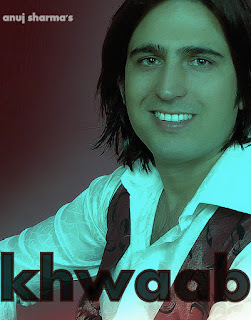 I have just released my dream "Khwaab" out in public & I have to work hard to make my dream come true. You have been doing Himachali albums so far. How is the experience with your first Hindi music album ‘Khwaab’? It was quite different from the Himachali albums and other Hindi songs playback singing. I have tried something completely new for the first time in ‘Khwaab’ and that is rock music. My music director(s) also wanted me to do something new and completely different. I worked extra hard and tried rock songs. I evolve through this experience; I came to know about the real world of Music Recording. I came across national & international people & there way of working was very different. I enjoyed working with them and learned a lot!! Like Mohit, will you include any Himachali folk in your Hindi albums in future? I recorded a full album for Himachalli Folk, in fact it was recorded even before ‘Khwaab’ & it will be released soon. Because of my knowledge and experience of Himachal music it’s obvious that people would expect folk influence in my Hindi album also. But I kept that separate; I thought folks need to be separated from anything as they contain the sweetness of culture. I have learned lot from this experience & I am going to use this to Himachali Folks in my future albums. What are your plans for future? Any playback singing offer? Mentioned before, I have to release my Himachali Album. I have to keep giving good Music. As for play back offer, I am expecting some chances after this album since it really shows my strengths in bringing a variety of music from soft and slow to rocking! I mentioned before my journey in music is beginning now. It requires lots of efforts, courage & of course wishes of people who love and enjoy my singing. Is there anything you would like to say to readers of DevbhoomiHimachal? When I was in Indian Idol, I read few articles about me on DevbhoomiHimachal, there the connection began with readers of DevBhoomi Himachal. I also remember that some of videos & audio links were shared to readers of Devbhoomi. I am extremely thankful for the people working for DevbhoomiHimachal & readers for supporting me. There is no words except a BIG THANK & I expect the same love for my album ‘Khwaab’ which they shown to me during Indian Idol time. I also need wishes so that I can grow more with music. we pround on you mr. anuj shrama, your album much better than many who released it b4 you. you put your self a great figure in the time to come. god bless you. i like your Khwaab's songs. you have a fantastic voice. i am sure you have bright future ahead. keep working hard, it will pay one. U have very beautiful and﻿ modern voice. I listened all your songs in my office. They all are very nice especially ur song Khawaab Bhi Kab Huya Itna Haseen is mesmerising. Really! First of all Congrats for all the success as well as for your new album..was just hearing your posted song..u rocckkk man. I have seen u from the days of your first vedio kunju chanchalo..and thereafter the success at the Indian Idol.U are an inspiration to all the Himachalis who want to do well outside the state also. Keep the good work going, all the best for the promotion of the latest album and i will keep following you..bye..tk cr..